Sometimes you need a stronger wax formula for those stubborn, hard-to-reach hairs found in smaller areas of the body. Our Satin Smooth hard wax is the ideal product to wax facial hair or sensitive areas such as your underarms. It leaves your skin smooth and moisturized, protecting you from post-wax irritation and inflammation. 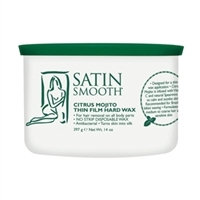 Satin Smooth salon wax is a great alternative to traditional wax as it eliminates all of the negative side effects. Instead of sticking to your skin, Satin Smooth non-strip wax sticks to your hair, providing more efficiency and less pain for your clients. For your aestheticians, Satin Smooth strip less wax makes for an easier process; they have less to clean up and it doesn’t leave any residue. Easy to clean and easy to remove, Satin Smooth moisturizing wax is ideal when your clients are just stopping by for a quick touch-up. We offer Satin Smooth pebble wax, Satin Smooth wax beads and hard wax in tub form. Citrus Mojito soothes and moisturizes skin with Vitamin C and Natural Spearmint Oil. Formulated with enriched extracts from Calendula flower and the Tea Tree plant, which calm and soothe the skin and prevent inflammation. Formulated with enriched natural cherry fruit extracts and essential oils of Vitamin E which soothe skin and protect from irritation.